Looking for your perfect groom?🤵✨(Aren’t we all? Lol) Well, look no further than @kleinburgvet! ✂️ We are now proud to offer grooming.. So we were *literally* overrun by puppies and kittens yesterday at @kleinburgvet! Our fur kids aren’t just any little monsters…they’re..
Spring forth!Endless gratitude to the sweet and talented ladies, producers & crew of @thesocialctv for having @kleinburgvet‘s Dr. Rebecca return..
@randiibrassard is about as a golden -hearted as they come. It’s your 25th bday tomorrow and we can’t think of anyone more worthy of celebrating!.. Halloween is just around the corner and although it is a very fun and festive time of the year, it is important to keep safety in mind when it comes to your dog or cat. Here are some simple steps to take to ensure you and your family have a safe and fun Halloween alongside your pets! If you plan on dressing your dog or cat in a costume, make sure they are not overly stressed at the idea. Just like kids, our pets’ costumes should be safe, properly fitted and not restricting their face, neck or movement. Make sure there are no pieces your pet could choke on and do not leave your pet unsupervised while wearing a Halloween costume. Although it may seem like a fun idea to bring your dog along for trick-or-treating, it is best to leave them at home. There are many opportunities for your dog to become spooked and run away, or eat something they shouldn’t off the street. Keep your pets in a safe place in the house during trick-or-treating hours. A scared cat or dog can easily run out the door, therefore, it’s best to keep them locked in a safe room or crate where they feel safe. Pets often show signs of aggression when overwhelmed or scared and it is best to remove them from any daunting situation. 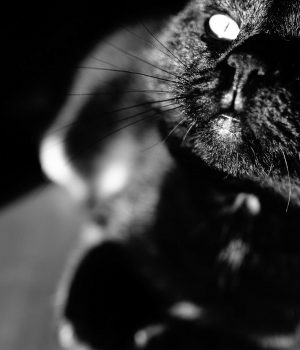 Keep your outdoor cats inside over Halloween and be particularly cautious if you have black cats as they often go missing on Halloween night due to horrible pranks or cruelty-related incidences. Halloween is a great time to get your pet microchipped or to scan a previously inserted microchip to ensure it is still working and up to date. Book an appointment prior to Halloween with your veterinarian to discuss a microchip, as it is an invaluable tool if your pet happens to run out on Halloween night. Microchips provide a lifetime of identification and all animal shelters and veterinarians have scanners that can get your pet’s information to get them back home. Do not leave hazardous decorations around your pets in the house. Refrain from lit candles in pumpkins and small ingestible decorations when they can be reached by your pet. Also, keep all candy and chocolate out of reach from your pets as they can be toxic to pets. The last place you want to end up on Halloween night is the emergency room with your pet!